Information on Canada Trade Missions and other international trade events for Canadian exporters. Canada Trade Missions are led by the Minister of International Trade or other senior government officials. International trade events in Canada and around the world. A quiz to evaluate your export readiness. How to export your products and services abroad. Past trade mission locations and sectors of focus. Join the Indigenous business delegation to Texas and Oklahoma from May 30 – June 4, 2019. Join the Business Women’s trade mission to Baltimore, Maryland - June 23-27, 2019. 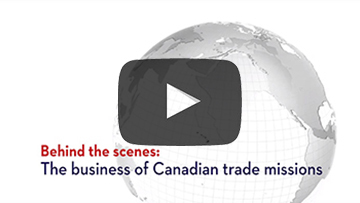 Learn how trade missions can help your business.